As recently as the 1990s, a typical Vermont furniture auction would consist entirely of farmhouse-style antiques, says Ethan Merrill, one of the state’s leading auctioneers. As one striking indicator of this shift, the Duane Merrill & Co. auction house in Williston will be the site this Saturday of a sale of several pieces of furniture and hundreds of artifacts designed by Andrew Szoeke (1893-1969). The pieces were consigned to the auctioneers following the death last year of Szoeke’s son, Thomas, a cabinetmaker who lived in Springfield, Vt. While hardly a household name, Andrew Szoeke (pronounced Zo-key) is well known among collectors of mid-20th-century furniture, Merrill says. He’s also famous in some circles for the designs he created for Hallmark, including the version of the crown logo that the greeting-card company has been using for the past 65 years. “He was a true Renaissance man,” observes Linus Leavens, a book and paper specialist at Duane Merrill & Co., the 77-year-old auction business that bears the name of Ethan’s father. Leading a visitor around the crammed auction gallery, Leavens and Ethan Merrill point out a large Szoeke needlepoint mounted high on a wall. The art-deco-style embroidery features at its center a woman’s head festooned with flowers. Surrounding it are four decorative panels that depict equally distinctive types of vases, such as a stylized theatrical mask and a model elephant. The mythological and literary characters Szoeke inlaid in the console’s wood veneers were not looking their best because they hadn’t yet been cleaned and polished for Saturday’s sale. Szoeke, who immigrated to the United States from Vienna in 1921, developed a style rooted in the Central European tradition that birthed the Bauhaus school. In addition to designing furniture with wood imported from Europe, he worked as a calligrapher and illustrator for advertising agencies and publishers. Szoeke also dressed windows for Fifth Avenue department stores. In 1948, his lettering on a sign in the window of Bergdorf Goodman caught the eye of a Hallmark executive, which led to a 20-year consulting gig. During that time, Szoeke conducted master classes for the company’s greeting-card designers. Antique dealers from Manhattan will be among the bidders at the auction. They have long since recognized the aesthetic, and monetary, value of custom-made mid-20th-century furniture, Merrill notes. “Some years ago, it was seen by a lot of people as just used furniture,” he says. Merrill is hoping for a strong turnout by Burlington-area bidders, as well. 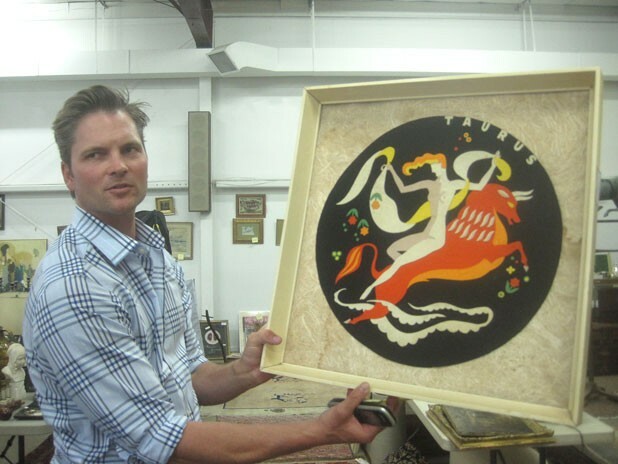 “There’s lately been a lot of local interest in pieces from that period,” reports the grandson of the auction gallery’s founder, Nathan Merrill. The business grew out of Nathan’s work for Green Mountain Power, Ethan explains. “He was putting electrical wiring into homes, so he saw a lot of Vermont attics and got intrigued by what was stored there,” the grandson relates. “He eventually went into the antiques business in Burlington, and it all developed from there,” Merrill says with a wave of his hand toward the furniture, paintings, rugs, glassware, ceramics and assorted tchotchkes that fill the gallery. “What we offer has changed a lot since my grandfather’s time,” says Merrill, a former pitcher in the Boston Red Sox minors who with his brother, Todd, judges collectibles on the reality-competition show “Picked Off” on the History channel. But the reality at the Williston auction house still looks and sounds much as it always has.